Go to original pattern for design DROPS 188-3. 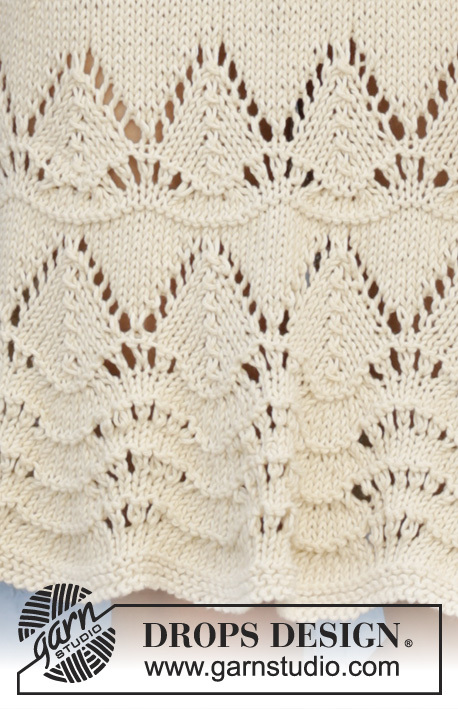 Knitted dress with lace pattern and ¾ sleeves. Size: S - XXXL Piece is knitted in DROPS Paris. 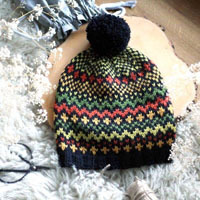 DROPS DOUBLE POINTED NEEDLES AND CIRCULAR NEEDLE (40 and 80 cm) SIZE 5 mm – or size needed to get 17 stitches and 22 rows in stocking stitch = width 10 cm and 10 cm vertically. 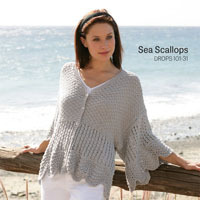 DROPS CIRCULAR NEEDLE (60 or 80 cm) SIZE 4 mm - for eyelet row in waist and edge in garter stitch around the neck. ACCESSORIES: 4 small wood beads for the twined strings. You can get the yarn to make this pattern from	16.15£. Read more. See diagrams A.1 to A.4. 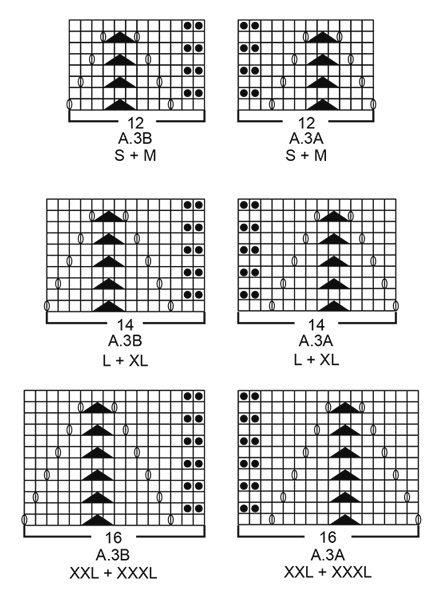 Choose diagram for your size (applies to A.3). When working wave pattern, the piece will curl in bottom edge. All length measurements are done from where curl is shortest. Decrease as follows after marker thread: Slip 1 stitch knitwise, knit 1, pass slipped stitch over stitch worked (= 1 stitch decreased). Decrease as follows before marker thread: Begin 2 stitches before marker thread, knit 2 together (= 1 stitch decreased). Decrease inside 3 edge stitches in garter stitch. All decreases are done from the right side. Decrease after 3 edge stitches as follows: Slip 1 stitch knitwise, knit 1, pass slipped stitch over (= 1 stitch decreased). Decrease before 3 edge stitches as follows: Begin 2 stitches before the 3 edge stitches and knit 2 together (= 1 stitch decreased). To calculate how to decrease evenly, use the total number of stitches on row (e.g. 180 stitches) and divide stitches by number of decreases to be done (e.g. 8) = 22.5. In this example work alternately every 21st and 22nd stitch and every 22nd and 23rd stitch together. All increases are done from the right side! Increase on each side of marker threads in the sides on dress and on each side of marker thread mid under sleeve as follows: Work until 2 stitches remain before marker, make 1 yarn over, knit 4 (marker thread is in the middle of these 4 stitches), make 1 yarn over (= 2 stitches increased). On next row/round work yarn overs twisted to avoid holes. Work in the round on circular needle from bottom edge and up until vent begins mid front, then work piece back and forth from mid front. After decrease for armholes work front and back piece back and forth separately. 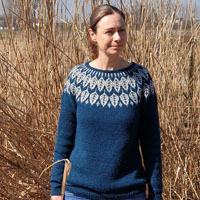 The sleeves are worked in the round on a short circular needle bottom up, switch to double pointed needles when needed. Cast on somewhat loosely 247-266-285-323-342-380 stitches on circular needle size 5 mm with Paris. Work 2 ridges in GARTER STITCH in the round - see explanation above. Then work A.1 (= 13-14-15-17-18-20 repetitions of 19 stitches). REMEMBER THE KNITTING TENSION! NOTE! On round marked with arrow-1 in A.1 displace beginning of round 2 stitches to the left to make the pattern fit. On round marked with arrow-2 in A.1 displace beginning of round 1 stitch to the left. When A.1 has been worked, there are 156-168-180-204-216-240 stitches on needle. Then work in stocking stitch. When piece measures 28 cm - read MEASURING TIP, insert 4 marker threads in piece as follows: Insert 1st marker thread after the first 18-21-24-30-32-38 stitches, insert 2nd marker thread after the next 42-42-42-42-44-44 stitches, insert 3rd marker thread after the next 36-42-48-60-64-76 stitches and insert 4th marker thread after the next 42-42-42-42-44-44 stitches. 18-21-24-30-32-38 stitches remain on round after last marker thread. Move marker threads upwards when working. On next round, decrease after 1st and 3rd marker thread and before 2nd and 4th marker thread – read DECREASE TIP-1 (= 4 stitches decreased). Decrease like this every 4½-4½-5½-5½-6-6 cm 7-7-6-6-6-6 times in total at every marker thread = 128-140-156-180-192-216 stitches. Remove all marker threads. When piece measures 59-60-61-62-63-64 cm (decreases are now done), knit 1 round while decreasing 0-0-0-8-0-4 stitches evenly = 128-140-156-172-192-212 stitches. Switch to circular needle size 4 mm and work A.2 in the round. When A.2 has been done, insert 1 marker thread at the beginning of round (= in the side), insert 1 marker after 32-35-39-43-48-53 stitches (= mid front) and 1 marker thread after 32-35-39-43-48-53 stitches (= in the side), there are 64-70-78-86-96-106 stitches between marker threads on back piece. Switch back to circular needle size 5 mm. Cut the yarn. Now work piece back and forth on circular needle from marker mid front. Begin first row from right side at marker mid front and work as follows: A.3B (= 12-12-14-14-16-16 stitches), 40-46-50-58-64-74 stitches in stocking stitch (marker thread in the side is in the middle of these 40-46-50-58-64-74 stitches), work A.3A (= 12-12-14-14-16-16 stitches), A.3B (= 12-12-14-14-16-16 stitches), 40-46-50-58-64-74 stitches in stocking stitch (marker thread in the side is in the middle of these 40-46-50-58-64-74 stitches) and finish with A.3A (= 12-12-14-14-16-16 stitches). Continue pattern back and forth like this. When piece measures 3 cm from division, increase 1 stitch on each side of marker threads in the sides - read INCREASE TIP (= 4 stitches increased). 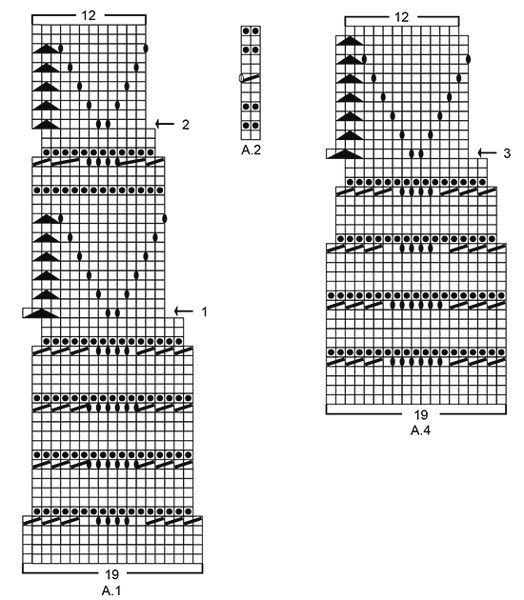 Repeat increase when piece measures 6-6-7-7-8-8 cm from division = 136-148-164-180-200-220 stitches. When piece measures 70-72-74-76-78-80 cm, work 2 ridges over the middle 12-12-14-18-22-26 stitches in each side (i.e. work 6-6-7-9-11-13 stitches in garter stitch on each side of both marker threads – work the other stitches as before). On first row from right side after ridges cast off 6-6-8-12-16-20 stitches in each side for armholes (cast off 3-3-4-6-8-10 stitches on each side of both marker threads). Finish front pieces and back piece separately. = 31-34-37-39-42-45 stitches. Continue back and forth with A.3A towards mid front, stocking stitch and 3 edge stitches in garter stitch towards armhole (work first row from wrong side). When 3 rows have been worked back and forth, decrease for armhole on next row from right side - read DECREASE TIP-2. Decrease like this on every other row (i.e. every row from right side) 2-3-5-6-8-11 times in total = 29-31-32-33-34-34 stitches. Continue pattern back and forth as before with 3 edge stitches in garter stitch towards armhole, stocking stitch and A.3A towards mid front until piece measures approx. 84-87-90-93-96-99 cm (adjust so that next row is worked from wrong side and adjust to finish after one whole repetition vertically if possible). Now slip the first 7-8-8-9-10-10 stitches on 1 stitch holder for neck but to avoid cutting the yarn work them before slipping them on the stitch holder. Continue to cast off for neck at beginning of every row from mid front (i.e. at beginning of each row from wrong side) as follows: Cast off 2 stitches 2 times and 1 stitch 3 times = 15-16-17-17-17-17 stitches remain on shoulder. Work until 1 row remains before piece measures 90-93-96-99-102-105 cm, knit 1 row from wrong side and cast off by knitting from right side. = 31-34-37-39-42-45 stitches. Continue back and forth with 3 edge stitches in garter stitch towards armhole, stocking stitch and A.3B towards mid front (work first row from wrong side). Continue pattern back and forth as before with A.3B towards mid front, stocking stitch and 3 edge stitches in garter stitch towards armhole until piece measures approx. 84-87-90-93-96-99 cm (adjust so that next row is worked from right side and finish on the same row in A.3 as on left front piece). Continue to cast off for neck at beginning of every row from mid front (i.e. at beginning of each row from right side) as follows: Cast off 2 stitches 2 times and 1 stitch 3 times = 15-16-17-17-17-17 stitches remain on shoulder. Work until 1 row remains until piece measures 90-93-96-99-102-105 cm, knit 1 row from wrong side and cast off by knitting from right side. = 62-68-74-78-84-90 stitches. Continue back and forth with 3 edge stitches in garter stitch in each side, stocking stitch and A.3A/A.3B mid back (work first row from wrong side). 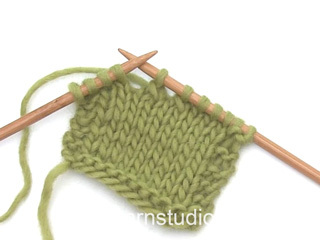 When 3 rows have been worked back and forth, decrease for armhole in each side on next row from right side - read DECREASE TIP-2 (= 2 stitches decreased). Decrease like this on every other row (i.e. every row from right side) 2-3-5-6-8-11 times in total = 58-62-64-66-68-68 stitches. 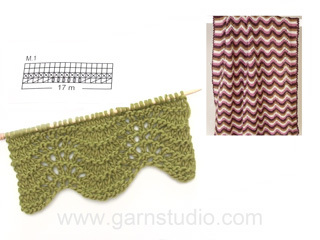 Continue pattern back and forth as before with A.3A/A.3B mid back, stocking stitch and 3 edge stitches in garter stitch in each side towards armholes until piece measures 88-91-94-97-100-103 cm. Now cast off the middle 26-28-28-30-32-32 stitches for neck and finish each shoulder separately. Continue as before over shoulder stitches and cast off 1 stitch for neck on next row from the neck = 15-16-17-17-17-17 stitches remain on shoulder. Work until 1 row remains until piece measures 90-93-96-99-102-105 cm, knit 1 row from wrong side and cast off by knitting from right side. Work the other shoulder the same way. Cast somewhat loosely on 76-76-76-95-95-95 stitches on short circular needle size 5 mm. Work 2 ridges in the round. Then work A.4 (= 4-4-4-5-5-5 repetitions of 19 stitches). NOTE! On round marked with arrow-3 in A.4 displace beginning of round 2 stitches to the left to make the pattern fit. When A.4 has been worked, there are 48-48-48-60-60-60 stitches on needle. 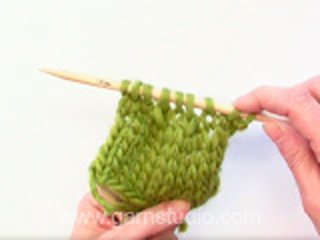 Work in stocking stitch until piece measures 20 cm - remember MEASURING TIP. Knit 1 round while decreasing 6-4-2-12-10-8 stitches evenly = 42-44-46-48-50-52 stitches. 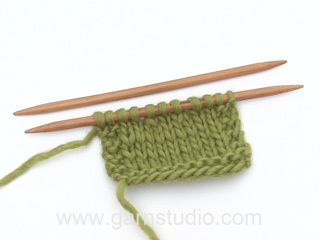 Switch to double pointed needles size 4 mm and A.2. After A.2 switch back to double pointed needles size 5 mm. Insert 1 marker thread at beginning of round (= mid under sleeve). Work in stocking stitch in the round. When piece measures 25-25-25-26-26-26 cm, increase 2 stitches mid under sleeve - read INCREASE TIP. Increase 7-9-9-11-12-14 times in S: On every 4th round, in M and L: On every 3rd round, in XL: on every other round, in XXL: Alternately on every and every other round and size XXXL: On every round = 56-62-64-70-74-80 stitches. When piece measures 38-38-37-37-35-34 cm, cast off the middle 6 stitches under sleeve (cast off 3 stitches on each side of marker thread). Now work sleeve cap back and forth on circular needle, i.e. continue with stocking stitch and cast off at beginning of every row in each side as follows: Cast off 2 stitches 2 times and 1 stitch 3-3-3-5-6-8 times. Then cast off 2 stitches at beginning of every row in each side until piece measures 45-45-45-46-46-47 cm. Cast off 3 stitches at beginning of the next 2 rows and then cast off the remaining stitches. Sleeve measures approx. 46-46-46-47-47-48 cm. Work another sleeve the same way. Sew the shoulder seams. Sew in sleeves - edge in garter stitch along armholes should be on the outside of sleeve (i.e. place the edge in garter stitch a bit over the edge along sleeve cap). Sew the opening at the mid front, start at the bottom and sew up until 10 cm remain before the neckline (or desired length) – sew in the outermost loop of the outermost stitch so that the seam is flat. Begin mid front and pick up from right side approx. 72 to 88 stitches around the neck (including stitches on stitch holders at the front) on circular needle size 4 mm. Knit 1 row from wrong side, knit 1 row from right side and knit 1 row from wrong side. Cast off knitting from right side. Cut 2 strands Paris of 3 metres each. Twine the strands tog until they resist, fold the string double so that it twines again. Make a knot at each end. Fasten a small wooden bead in each end of the tie. Make 2 tassels and fasten one tassel in each end of string, under wooden bead in each side. 1 tassel = cut 12 strands Paris of 11 cm each. Cut 1 strand of approx. 25 cm to fasten tassel with and place this strand in the middle of the 12 strands. Fold the thread double and tie a new thread around the tassel (approx. 1 cm from the top), fasten tightly and sew tassel to string as explained below. Make the other tassel the same way. Place string with tassels double and thread loop through a stitch at the top of vent at the front on dress, pull string ends through loop. Make a similar string with wooden beads and tassels and fasten it at the top of vent on the other side. Added info about sewing the opening at front piece. Jeg er helt i vildrede med A2 mønsterdelen. Der står jeg skal strikke to ret sammen og får således halveret maskeantallet og står med alt for få masker, når jeg skal til at sætte mærketrådene og strikke frem og tilbage. Hvordan skal jeg forstå A2? Hei Mette. På rad 7 i A.2 skal du strikke 2 rett sammen, og så lage 1 kast. Dvs, du feller 1 maske og øker 1 maske slik at maskeantallet i A.2 forblir konstant. God fornøyelse. Dear Mrs Meise, can you please write on our facebook the words you used and was forbidden - there could be a word in another language that is banned. Thank you! The sleeves contain an instruction to follow A.2 but surely this is wrong? Also is the top of the sleeve created in 8 cm? If you follow A.2 the number of stitches for the upper sleeve would be 21. 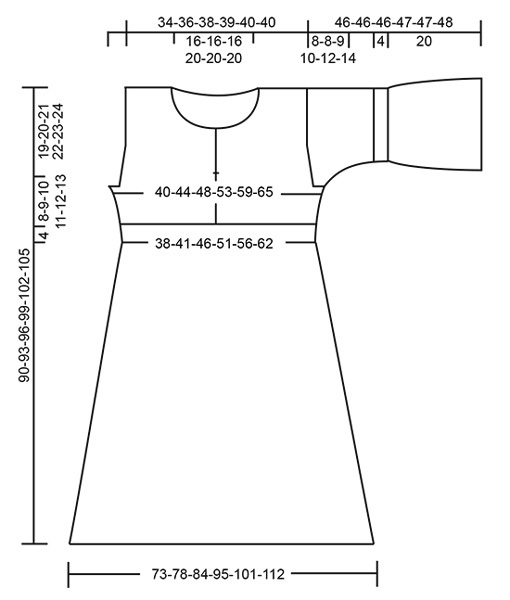 Dear Mrs Meise, pattern is correct, after A.4 you work A.2 (= eyelet round which tighten the sleeve - see picture and measurement chart). You work A.4 until sleeve measures 20 cm, then work A.2, then inc mid under sleeve and when sleeve measures 38 cm (size S), start sleeve cap binding off 6 sts mid under sleeve and continue shaping sleeve cap. Sleeve measures approx. 46 cm in total. Happy knitting! Dear Mrs Meise, on the row with the arrow 1 in A.1 (and the arrow 3 in A.4), slip the first 2 sts at the beg of round onto the right needle without working them, place the marker from beg of round there and start now repeating diagrams from here. The 2 slipped sts will be worked together with the last st last repeat on the round. Happy knitting! Prøver lige det rigtige sted! Når jeg strikker A.1 og A.4 kan jeg ikke få det til at danne et "V". I f.eks. A.1 har jeg flyttet omg. 2 masker og hullerne i rk 27 er fint symetriske med hullerne i rk 23. Når jeg så kommer til rk 29, så kommer 2. hul til at ligge oveni i 2. hul i række 27 og danner så ikke et "V". Hvad går galt? Hej Joan, på række 29 skal du have 9 m imellem omslagene (du starter altså diagrammet med 1 omslag), de sidste 3 masker i diagrammet strikkes sammen til 1 maske. God fornøjelse! Jeg har problemer med at få dannet et "V" i både A.1 og A.4. Rk 27 i A.1er fint symetriske med hullerne i rk 23, men når jeg kommer til række 29, så kommer 2. hul til at ligge oveni sidste hul i rk 27. Jeg har flyttet omgangen to masker, men kan stadig ikke få "V"ét dannet. Har forsøgt at strikke hele mønsteret, men det ser helt forkert ud. Bonjour et merci pour ce magnifique modèle. je suis actuellement au début de la poitrine et je rencontre une difficulté. Ai-je mal compris le patron ou les motifs "chevrons" (A.3A et A.3B) se retrouvent à l'avant ET à l'arrière ? C'est ce que je comprends, mais je trouve cela étrange que les photos ne montrent pas les détails du dos, dans ce cas... merci d'avance pour vos réponse et votre patience! Bonjour Gloria, on tricote effectivement A.3A et A.3B sur chaque devant et sur le dos. Bon tricot! How would you mix sizes? I am smaller on the bottom and bigger on top (by 1 size). Dear Lizzie, we are unfortunately not able to adjust every pattern to every single request, please contact the store where you bought the yarn (even per mail, telephone or via social media) for any assistance. Happy knitting! Hvordan er det å strikke denne kjolen i Drops Bomull-Lin? Holder den fasongen eller vil den utvide seg? Har kun strikket med Paris en gang og da synes jeg plagget ble veldig tungt. Tenkte derfor å prøve et annet garn. Hei Gro. Bomull-Lin oppfører seg ganske likt som Paris, da det er mye bomull i begge. De tilhører også begge garngruppe C, så det er ikke noe problem å bytte Paris med Bomull-Lin. På garnkalkulatoren vår kan du finne ut hvor mange gram garn du trenger av andre garntyper for å få tilsvarende mengde som i Paris, så her kan du sjekke vekten til plagget i forskjellige kvaliteter. God fornøyelse.